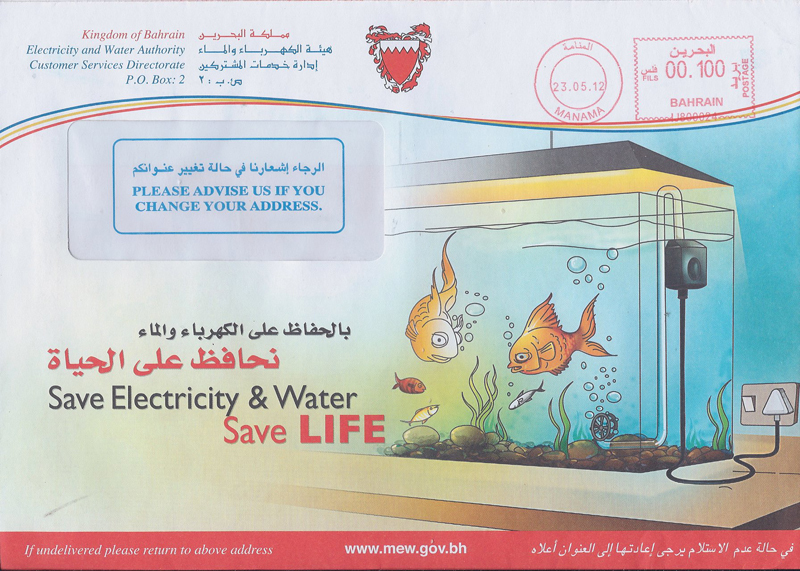 The Ministry of Electricity and Water decorates our bills with helpful hints. However, this month’s suggestion to “Save Electricity and Water , Save LIFE” stumped me for a few moments. The electrical outlet for the fish tank’s air supply was intentionally included in the drawing. Hmmm. If we reduce the fish’ water and air, we would kill them, not save their lives. Is MEW implying that fish tanks are a useless waste of water and electricity? 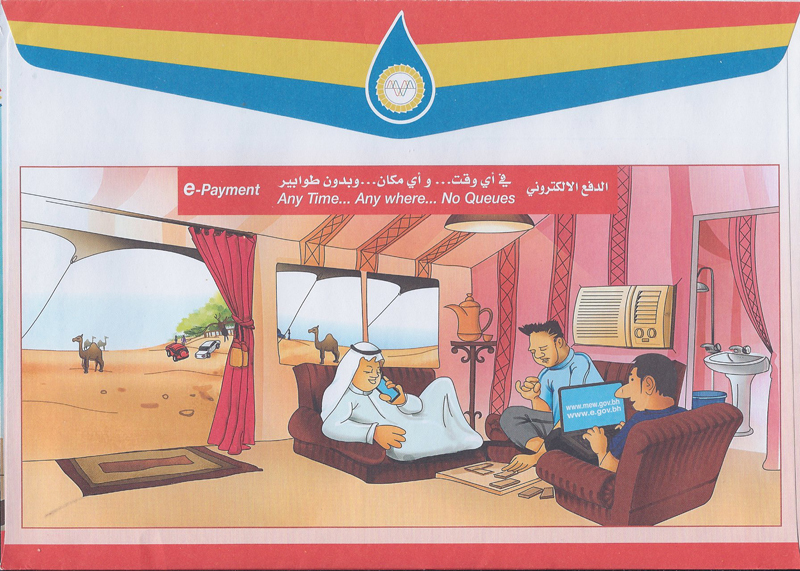 On the envelope’s opposite side is a wonderful drawing of modern Bahrainis getting back to nature during camping season. While enjoying life in the countryside, and without leaving their tents, they can pay their electricity bill from their mobile phone or laptop. As the drawing shows, unlike their ancestors who had to put up with the desert’s heat and lack of water, modern men can enjoy desert without suffering its inconveniences. The traditional fabric tent’s interior is equipped with electric lighting, air conditioning and running water. Even sand in your pant is no longer a problem because everyone sits on sofas. Save a LIFE. Of course! They want to save camels’ lives by ridding them of their burdens. Instead of a camel, it is much better to use a sport-utility vehicle to haul all that equipment out to the campsites around the Tree of Life. And do not take your fish to camp. They should left at home – where they belong. I’m scratching my head at the first suggestion, too. Someone didn’t think that through very well. One of the mysteries of life. Thanks Eva, your usual pithy observation. I have written a little column article for the GDN on water wastage and it should be out soon. Given the increasing salinity of the Gulf as a result of Desal plants, pretty soon the only place where you will be able to see fish is in an aquarium!! I appreciate your efforts but I am afraid it is too late. Well, they are saving all those fish in those giant aquariums at all the biggest-malls-in-the-world…So,…save your own electricity by sending your fish to the mall, where all their electricity and water usage saves the life of the fish! … ? So, “Let’s all go shopping!” ..? I love/hate zoos and aquariums. I am not certain what the solution is.